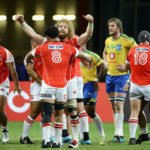 Whatever the outcome of Saturday’s Super Rugby final, it should still serve as an occasion to celebrate the enduring influence of Johan Ackermann, writes CRAIG LEWIS. The Lions can still go on to win this season’s Super Rugby title, but they need to heed the lessons learned from their last two major playoff games, writes CRAIG LEWIS. Kwagga Smith has evolved into one of the most impactful players in South African rugby, writes CRAIG LEWIS. The Kings have not only provided plenty of on-field entertainment this season, but also proved a point by leading the way in terms of transformation, writes CRAIG LEWIS. Ruan Combrinck and Warrick Gelant would add real value to the Springboks’ Rugby Championship squad, writes CRAIG LEWIS. In-form Lions players emphatically vindicated their selections for the Springboks during the June series against France, which bodes well for the business end of Super Rugby, writes CRAIG LEWIS. Rassie Erasmus would add immense value to a South African rugby system that finally appears to be showing signs of functioning efficiently again, writes CRAIG LEWIS. Frans Steyn has a rare opportunity to reinvent the manner in which his Springbok career will be remembered, writes CRAIG LEWIS. Elton Jantjies must use the three-Test series against France to finally prove he is ready to settle at Test level, writes CRAIG LEWIS.